Note: Only a small quantity of F is needed for this project. Many cultures throughout the world believe that ladybugs are lucky. Beliefs include financial luck, illness cure, granting of wishes and even luck in love. We can’t guarantee good luck, but whoever gets to use this bright crocheted throw will surely feel lucky. Gauge/Tension: GAUGE: Rounds 1–9 = 7¾” (19.5 cm); 9 dc = 3” (7.5 cm); 8 rows = 4½” (11.5 cm) in double crochet. CHECK YOUR GAUGE. Use any size hook to obtain the gauge. Throw measures 45” x 45” (114.5 x 114.5 cm). shell = 5 dc in indicated stitch. surface slip st (surface slip stitch) = With yarn held on wrong side, insert hook in indicated stitch or space, yarn over, pull loop to right side through loop on hook. 1. 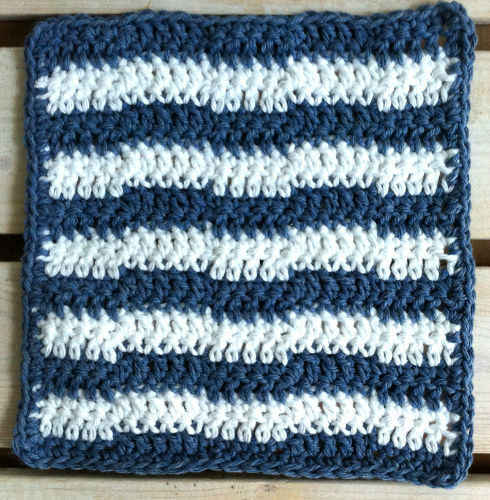 Throw is made with one large center square bordered by 12 small squares. Each square is worked in joined rounds with right facing at all times. 2. Squares are sewn together and edged with border worked back and forth in rows. marker for beginning of round and move marker up as each round is completed. Round 1 (right side): Work 11 dc in 4th ch from hook (beginning ch count as first dc); join with slip st in top of beginning ch—12 dc. Round 3: Ch 3, 2 dc in next dc, *dc in next dc, 2 dc in next dc; repeat from * around; join with slip st in top of beginning ch—36dc. Round 4: Ch 3, dc in next dc, 2 dc in next dc, *dc in next 2 dc, 2 dc in next dc; repeat from * around; join with slip st in top of beginning ch—48 dc. beginning ch—60 dc. Fasten off. Round 6: Working in back loops only, join B with slip st in same st as join, ch 4 (counts as first tr here and throughout), dc in next dc, hdc in next dc, *sc in next 9 dc, hdc in next dc, dc in next dc, tr in next dc, ch 3, tr in next dc, dc in next dc, hdc in next dc; repeat from * twice, sc in next 9 dc, hdc in next dc, dc in next dc, tr in last dc, ch 3; join with slip st in top of beginning ch—36 sc, 8 hdc, 8 dc, 8 tr, 4 ch-3 spaces. Round 7: Ch 1, sc in same st as join, *sc in each st around to next ch-3 space, 5 sc in next ch-3 space (corner made); repeat from * around; join with slip st in first sc—60 sc and four 5-sc corners. hdc) in center st; repeat from * twice, sc in each remaining st; join with slip st in top of beginning ch—92 hdc and 4 ch-2 spaces. Round 9: Ch 3, *dc in each st to next ch-2 space, (2 dc, ch 2, 2 dc) in next ch-2 space; repeat from * 3 times, dc in each remaining st; join with slip st in top of beginning ch—108 dc and 4 ch-2 spaces. Round 10: Repeat Round 9; change to C—124 dc and 4 ch-2 spaces. Rounds 11–14: Repeat Round 9—188 dc and 4 ch-2 spaces. With first color, ch 4. Rounds 1–8: Work same as Rounds 1–8 of Large Square. Fasten off B at end of last round. space, *3 sc in next ch-2 space, sc in each st around to next ch-2 space; repeat from * twice; join with slip st in first sc—104 sc. Round 1: Sc in 2nd ch from hook and in next 3 ch, 3 sc in last ch; working in opposite side of foundation ch, skip first ch, sc in next 3 ch, 2 sc in last ch—12 sc. Do not join at end of rounds until instructed. Place marker for beginning of round and move marker up as each round is completed. Round 2: Work 2 sc in next sc, sc in next 3 sc, 2 sc in next 3 sc, sc in next 3 sc, 2 sc in next 2 sc—18 sc. Round 3: Sc in next 2 sc, 2 sc in next sc, *sc in next 2 sc, 2 sc in next sc; repeat from * around—24 sc. Round 4: Sc in each sc around; join with slip st in first sc. Fasten off, leaving very long tail for sewing and embroidery. Round 1: Work 6 sc in 2nd ch from hook—6sc. Do not join. Round 2: Work 2 sc in each sc around; join with slip st in first sc. Fasten off, leaving a long tail for sewing. With F, *ch 5, slip st in 2nd ch from hook and in each of next 3 ch; repeat from * once. Refer to photographs as a guide for placement. 1. Place A-colored heads and spots on E–colored squares, C-colored heads and spots on A-colored squares, D-colored heads and spots on C-colored squares, and E-colored heads and spots on D-colored squares. Position each head with tail at top and sew all pieces in place. a slip knot and place on hook, pull hook and loop to right side, surface slip st evenly spaced across rounds to edge of Round 5. 3. With F, embroider French knot eyes and a couch stitch smile on each head. may vary but should be an odd number. Row 1 (right side): With right side facing, join E with slip st in center st of 3-sc group at top corner, ch 3, 108 dc evenly spaced across, working last dc in center st of 3-sc group at next corner, turn—109 dc. Rows 2–9: Ch 3, dc in each dc across, turn. With right side of bottom edge facing, work same as top edge. Row 1 (right side): With right side of side edge facing, join E with slip st in end of first row, ch 3, working in ends of rows, 17 dc evenly spaced across; working across small squares, dc in center st of first 3-sc group, 108 dc evenly spaced across, working last dc in center st of last 3-sc group; working in ends of last rows, 18 dc evenly spaced across, turn—145 dc. next row, sc in next row] 4 times; working in sts, *skip next dc, shell in next dc, skip next dc, sc in next dc*; repeat from * to * across; working in ends of remaining rows, sc in first row, [shell in next row, sc in next row] 4 times; working across side edge, shell in first dc; repeat from * to * across, skipping more or less sts as needed to end with shell in last dc; working across top edge; working in ends of rows of top edge, sc in first row, repeat from ** once; join with slip st in first sc. Fasten off.